This feast is appropriately observed on a weekday following the day of Pentecost. 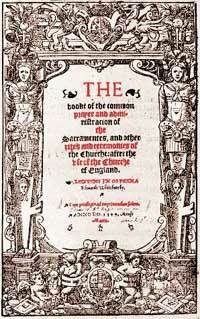 The ﬁrst Book of Common Prayer came into use on the Day of Pentecost, June 9, 1549, in the second year of the reign of King Edward VI. From it have descended all subsequent editions and revisions of the Book in the Churches of the Anglican Communion. Though prepared by a commission of learned bishops and priests, the format, substance, and style of the Prayer Book were primarily the work of Thomas Cranmer, Archbishop of Canterbury, 1533–1556. The principal sources employed in its compilation were the medieval Latin service books of the Use of Sarum (Salisbury), with enrichments from the Greek liturgies, certain ancient Gallican rites, the vernacular German forms prepared by Luther, and a revised Latin liturgy of the reforming Archbishop Hermann of Cologne. The Psalter and other biblical passages were drawn from the English “Great Bible” authorized by King Henry VIII in 1539, and the Litany was taken from the English form issued as early as 1544. The originality of the Prayer Book, apart from the felicitous translations and paraphrases of the old Latin forms, lay in its simpliﬁcation of the complicated liturgical usages of the medieval Church, so that it was suitable for use by the laity as well as by the clergy. The Book thus became both a manual of common worship for Anglicans and a primary resource for their personal spirituality. I Almighty and everliving God, whose servant Thomas Cranmer, with others, did restore the language of the people in the prayers of thy Church: Make us always thankful for this heritage; and help us so to pray in the Spirit and with the understanding, that we may worthily magnify thy holy Name; through Jesus Christ our Lord, who liveth and reigneth with thee and the Holy Spirit, one God, for ever and ever. Amen. II Almighty and everliving God, whose servant Thomas Cranmer, with others, restored the language of the people in the prayers of your Church: Make us always thankful for this heritage; and help us so to pray in the Spirit and with the understanding, that we may worthily magnify your holy Name; through Jesus Christ our Lord, who lives and reigns with you and the Holy Spirit, one God, for ever and ever. Amen. Ask, and it shall be given unto you … voila! I realize this is an unusual commemoration in that it’s about a book and not a person, but I am in awe of the BCP, and am thankful for it’s spiritual wholeness and wisdom, not just its literary qualities. The narrative does what it should do, and the collect does as well. The readings don’t knock me over with enthusiasm, but frankly, Scarlett…. For the Epistle, how about Acts 2:1-11 (“every man heard them speake with his owne language”)? Not only does it underscore the importance of doing the service in the language of the people, but it was the Epistle read at the first use of the BCP in 1549. Likewise, Psalm 33 was the Psalm appointed for Pentecost in the 1549 Book, so it’s a keeper. They read the whole thing back then, and maybe we should, too. The 1549 Gospel was John 14:15-22, which is at least as good a fit as 4:21-24, and using it avoids the jarring “woman” (what woman?) in the first verse of the present reading. As this is an unusual feast, why don’t we follow the 1549 Book’s lead and not have an Old Testament reading at all? If we must have three readings, maybe a second New Testament passage could be used, like Acts 19:1-7 (a shortened version of the Pentecost Evensong reading from the 1549 Book), Acts 10:34-43 (from Pentecost Matins), or Romans 8:11-17 (“how are they to believe in him of whom they have never heard?”). 2) The BCP continued (and continues even today) to be used in Latin in certain, primarily academic circumstances: e.g., the first mass of term at Oxford. 3) Don’t underestimate the intelligibility of the Latin mass (see Duffy’s work for a counterbalance to the standard Protestant history of “no one knew any Latin at all whatsoever and they couldn’t understand anything the mean terrible priests were doing”) to laity of that era, or our own — this coming from someone who takes advantage of Latin masses whenever traveling outside the Anglophone world! as long as the liturgical color for this feast day are not BLACK, were doing good!